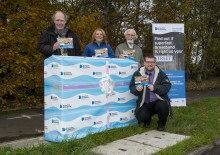 Author Craig Robertson joins Stirling Council and the DSSB team to unwrap Stirling's latest fibre broadband. More than 14,000 homes and businesses in the Stirling area are able to connect to high-speed fibre broadband thanks to the £428M Digital Scotland Superfast Broadband programme. The Digital Scotland team were joined by bestselling crime writer Craig Robertson to celebrate the latest fibre availability in the city of Stirling this week. Along with Councillor Jeremy McDonald - Chair of Stirling Council’s Broadband group - they visited one of the city’s new fibre street cabinets to discover what goes on inside. The local premises are among around 800,000 homes and businesses across Scotland which are now able to access fibre broadband through the Digital Scotland rollout. Other areas in Stirlingshire to benefit from the rollout, led by the Scottish Government, include Buchlyvie, Balfron and Aberfoyle as well as additional recent coverage in places like Doune and Drymen. More local coverage will follow as engineers from Openreach – Scotland’s digital network business - continue work on the ground. Local people can check the Digital Scotland website to find out if they are able to access the latest fibre broadband technology. People need to sign up with an internet service provider, as upgrades are not automatic. Bestselling author Craig Robertson, who lives in Stirling, has written several crime novels including Random, Witness The Dead, The Last Refuge and Murderabilia. His new novel The Photographer is due out in the new year. Craig said: “It was a pleasure to join the Digital Scotland team to celebrate the availability of fibre broadband in Stirling. It's good to see this project reaching more communities and giving an increasing number of homes and businesses the chance to connect to high-speed broadband. Finance and Economy Convenor Margaret Brisley said: “It is fantastic to see that progress continues to be made by the Digital Scotland programme, and to see areas like Buchlyvie, Balfron and Aberfoyle joining our other rural areas in being upgraded to superfast broadband, giving more local properties access to fibre. It is now more important than ever for our rural residents to have access to high-speed internet. Fibre broadband offers fast and reliable connections at speeds of up to 80Mbps* and there are many suppliers in the marketplace to choose from. Whether you own a business, work from home or want to keep in touch with friends and family, fibre broadband enables multiple users to connect to the internet at high speeds and get better, faster access to online services. Sara Budge, Programme Director for Digital Scotland Superfast Broadband, said: “As sponsors of the Stirling Winter Festival it has been fantastic to see that fibre broadband is benefiting local residents and businesses in and around Stirling. Robert Thorburn, Openreach fibre partnership director for Scotland, said: “It’s great that Craig took time out from his writing to help us spread the word that thousands of people and businesses across Stirling can now connect to their best ever broadband speeds. 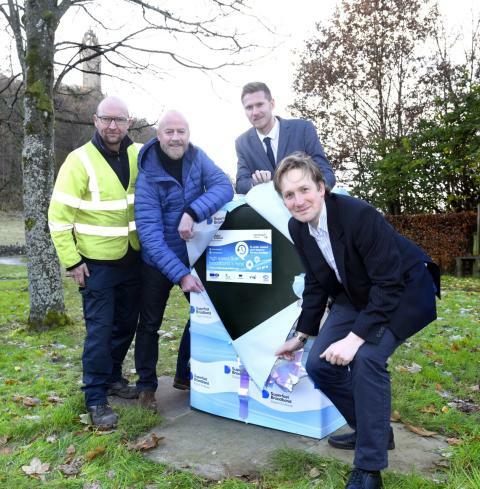 Caption: Ian Pearson (local operations manager for Openreach), Craig Robertson (local author), Stephen Chambers (Digital Scotland Community Project Officer) and Councillor Jeremy McDonald (Chair of the Broadband Driving Group) celebrate the latest fibre availability in the city of Stirling. Openreach to provide ultrafast broadband network for 11,850 more new homes across Scotland.